Right around this time a year ago, I wrote about some useful tips to save money on holiday season spending. Since this is one of the most expensive if not the most expensive event of the year for every family, the holiday season is actually a good opportunity to practice prudent spending. Undoubtedly, most spending during the holidays will be for gifts. 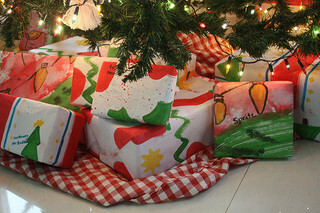 Gift-giving is central to the idea of celebrating Christmas. Although some would like people to think that the birth of Christ should be the focus, businesses are happy to know people enjoy gift-giving and receiving more than any other thing during Christmas. So it’s going to be to our advantage to think of gifts that are not that expensive but will still show we care. But are there such gifts readily available? And if there aren’t, can’t we create something that will meet those criteria? I’ve taken it upon myself to search for ideas from other people about this. I’ve got very few ideas of my own so I thought why not discover what other people do. I’m extremely excited to share these ideas and hope readers use them. But before I go on, I do realize that most people will explore only two options on how they will go about their gift-giving. They will do either of these two or both in combination. The ideas that I’m about to share are in neither of these categories. They presume you would want to give more effort to your gift-giving habits. They will require you to do a little more than just buy gifts. I know this can be discouraging to some folks because it’ll require some effort. It will be uncomfortable to those who believe buying gifts from their favorite malls is already a tiring activity in itself. Nonetheless, going out of your way to do these things will show the recipient of these gifts how valuable they are to you. Moreover, making the time and effort to do all this stuff will make the gift preparation activities much more exciting and fulfilling. I should point out that you can opt to do some of these in combination with just buying stuff and giving money as presents. Taking the time and effort to go the extra mile suggests that making gifts special should be reserved for those people you really care about. After all, you may not have all the time to make gifts for everyone you know. 1. Home-made cards - This activity requires some level of creativity. It’s not for everyone but if you believe you can do it, you should. Imagine the last time you received a hand-made Christmas card? You most likely have not or if you’re lucky you received a few when you were still a kid. Very few people write in long-hand nowadays to express how they feel. We’re mostly just placing comments on Facebook photos or status updates to express our feelings and appreciation. In a way, that has brought personalized messages scribbled on a piece of hand-crafted card even more attractive, thoughtful and desirable. 2. Personalized video CD’s - Facebook is a good source of your friends and relatives’ photos that you should take advantage of. You can collect photos of a friend or a loved one and create a slide show set in music. This can be done with Windows Movie Maker or any other video editing software. Just make sure that your music jives in well with the photos you’ve chosen. You can then record the resulting video to a CD and wrap it as a gift. Sometimes it’s easier to do this for a group of friends. That’s because doing one for every single person can be time-consuming. A group of friends can be equally happy for the same video where all of them are shown. 3. Personalized travel brochures - Most people would like to see themselves traveling to a famous tourist destination someday. Although you may not have the money to give your friends a free trip to Paris, for example, but you can create something that may suggest he or she has been there already. And that can be done through a personalized travel brochure. You basically Photoshop a picture of your friend and place him beside the Eiffel Tower. Create a few more pages for different locations and you’ll have a travel brochure that your friend can keep as his or hers. It won’t cost too much but it’ll surely receive a hearty appreciation. 4. Personalized calendars - The holidays is also a reminder that a new year is near. That’s why calendars are commonly given or sold. Most of these calendars feature products or personalities. But if you have the time, you may create one which feature a friend or a loved one. The end result will depend on how creative you are in designing the calendar. You can put photos with captions printed out. You may also mark special dates for your target recipient. 5. Personalized printed T-shirts - There are many T-shirt printing services available where you can personalize the prints to your liking. This presents an opportunity for a more thoughtful gift that you can be proud of. It doesn’t take too much effort and it’s certainly not that expensive. But it is surely better than just any ready-to-wear T-shirt for the thought that comes with it. 6. Personalized coffee mugs - Similar to T-shirt printing, you may opt to give coffee mugs with personalized prints as Christmas gifts. You won’t do the printing yourself but it will still give the impression that you took the effort to create it. That will be appreciated much more than the gift worth. If you’ve observed, most of the suggestions strives to show that apart from just giving stuff, you care so much for the other person that you took the effort to create the gift specially customized for him or her. We know that money and time are resources that we all have. With these Christmas gift ideas, you’ll make someone happy by giving both while sticking to your Christmas budget.